Locatelli's career followed a relatively unusual trajectory. Born in Bergamo, he went to Rome at the age of sixteen where he studied with Valentini - and, somewhat less probably, with the ailing and soon-to-be-deceased Corelli. From 1723 onwards he began to make his peripatetic career, primarily as a violin virtuoso, becoming virtuoso da camera in Mantua in 1725 before attracting admiring attention, as he moved on from place to place, in Venice, Munich, Dresden, Berlin and Kassel inter alia. Then in 1729 he settled in Amsterdam, remaining there until his death in 1764. Perhaps he was simply weary of travelling and of the pressures on the virtuoso performer who had to live up to his reputation - or make a new one - in each fresh city or court. Whatever his reasons, in Amsterdam he settled into a way of living in which activities such as teaching and composing, working in music publishing and revising his own works, seem to have taken precedence over performance. His Opus 4 set was published, in Amsterdam in 1735, by the French Hugeunot Michel-Charles Le Cène (c.1684-1743), a publisher for whom Locatelli, in his Amsterdam years, sometimes worked as a proof-reader. Locatelli's Opus 4 is a somewhat schizophrenic collection, made up of six so-called 'Introduttioni Teatrali' and six 'Concerti'. The status of the Introduttioni Teatrali is hard to determine. Structurally, with their sequence of fast - slower- fast - movements, they belong in the tradition of the Neapolitan overture. But whether or not they were written for actual theatrical use - if so, when and where? - is not known; perhaps their title is meant to indicate no more than style and atmosphere rather than specific use - an early version of the 'concert overture' as it were. 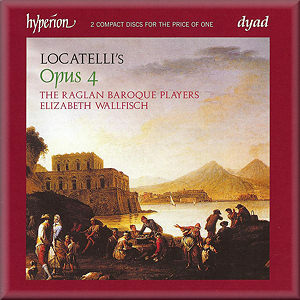 Elizabeth Wallfisch and the Raglan Baroque Players play them with fair verve and vibrancy; a number of the slow central movements are particularly fine and affecting. A little more sense of theatricality in the outer movements - especially in the attention-grabbing first movements wouldn't perhaps have gone amiss. This is music well-suited to the more overtly theatrical and spotlit methods of, say, Rinaldo Alessandrini or Andrea Marcon. Is there an intended relationship between the six concertos which complete Locatelli's opus 4 and the Introduttioni which precede them? Are the two groups meant to complement one another stylistically? To comment on one another somehow To suggest alternative musical possibilities? Or is opus 4 merely to be viewed as a miscellany? Superficially the concertos look relatively conventional in structure, but closer inspection reveals a good deal that is odd and individual. The music is constantly inventive and often rather surprising - listen, for example, to the horn imitations in the eighth concerto or the remarkable minuet and variations which closes the tenth concerto. The playing here is excellent and perceptive, the interplay of soloist(s) and ensemble beautifully judged.